As the impact of Britain leaving the European Union continues to clarify, David Coombs, Fund Manager and Head of Multi-Asset Investments at Rathbones discusses the potential issues that are likely to affect us in the months ahead. The recovering oil price will also be brought into focus, as will the struggling Eurozone economy. Join us on Thursday 7th July, at 11am as David Coombs talks politics on both sides of the pond in a world where the possibility of Trump becoming President becomes reality in the US presidential race. 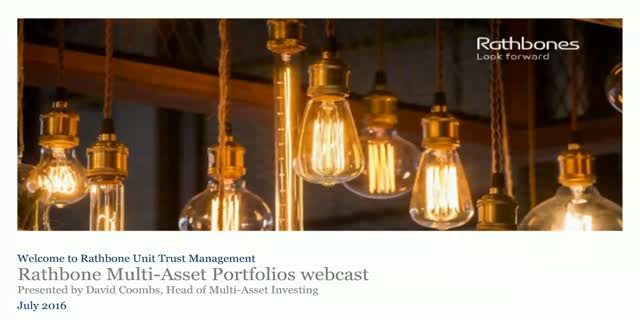 The Rathbone Multi Asset Portfolios have been designed for advisers seeking to generate a level of return within defined levels of risk for clients. This approach differs from most multi-asset products, which seek to maximise returns against their peers rather than being managed to a client-led volatility expectation. Put your questions to David in advance or during the call using the ‘rate this’ tab at the top of the video screen. A recording will be available 'on demand' after the call if you unable to join us at 11am.